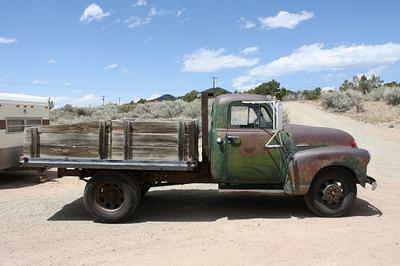 10/6/2015 Santa Fe, New Mexico - 1950 1 1/2 ton flatbed (size of a pickup), 4-speed, 235 c.u., dual rear wheels. Air assist brakes. Street legal. Perfect for restoration. Original green paint. New parts. Call Mark---(505)983-7168---Santa Fe.